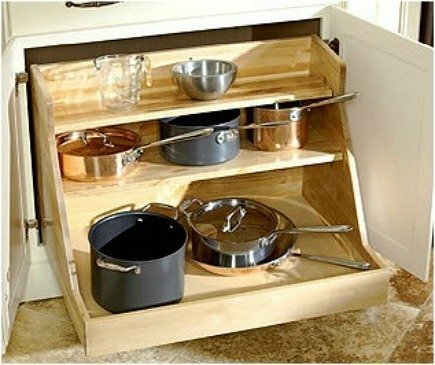 Clever built in kitchen cabinet ideas for storage and workability. We’ve all seen the spice drawer with labeled bottles, as well as the currently popular base cabinet drawer dowels to hold dishes. It’s great to be organized and even better to have built-ins that make everyday life in the kitchen convenient. 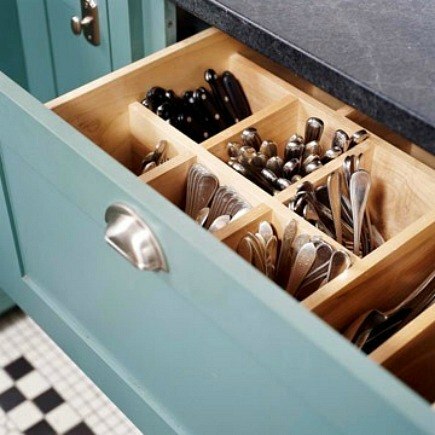 So who wouldn’t love this partitioned utensil drawer next to the dishwasher — a built in that makes unloading quicker? Pull-outs are always a plus. With this triple shelf system, everything can be seen and easily accessed. When I originally saw this photo, I thought wooden dowels had been used in the pantry to divide the platters and chopping boards. But they’re actually window tension rods. No need to wait for a kitchen remodel to put this idea to use. 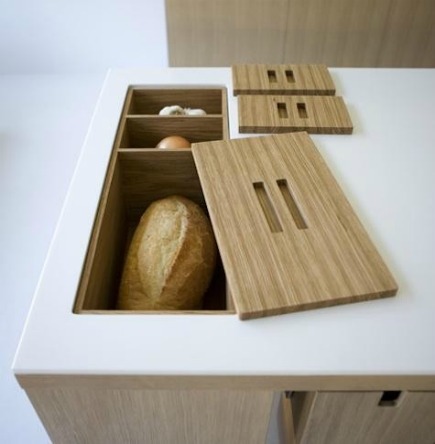 It can be adapted to most cabinets. 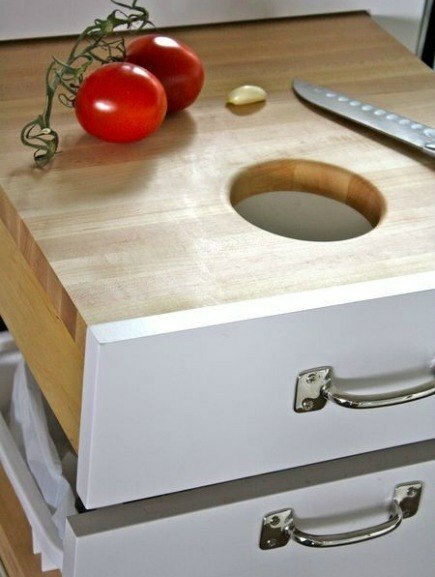 I’m not sure how practical these countertop storage bins are but I like the idea. Bread, onions and garlic –or other foods that don’t require refrigeration — are kept nearby. Pull-out cutting boards are less common than decades ago. But when a well is cut in the wood in a board that’s place over the trash can, the pullout becomes a secondary prep spot where crumbs and trimmings can be quickly swept into the pull-out trash bin below. For more ideas, see Custom Kitchen Cabinet Ideas 2 and More Custom Kitchen Cabinet Ideas. The tension rods are a FABULOUS idea! Would love to have that silverware drawer. Rethinking the orientation at which you store stuff in your cabinets makes all the difference in the world. Again, great ideas. My tomatoes (and much else) would be rolling down through the hole into the trash. LOL But I love all these ideas, particularly the last 2 and the top 1 (I think the cabinet color is contributing to the appeal)…As long as they pull out for occasional cleaning. Not sure I like the bread/onion cubbies. All I can think of is all of the crumbs that would need to be vacuumed out on a daily basis. It would drive me batty! The tension rods are so clever – no shelf height commitment required! 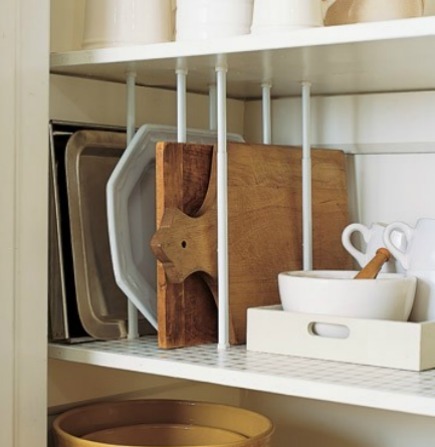 I love the vertical silverware storage too – I’m going to go test that out with wire mesh pencil cups.